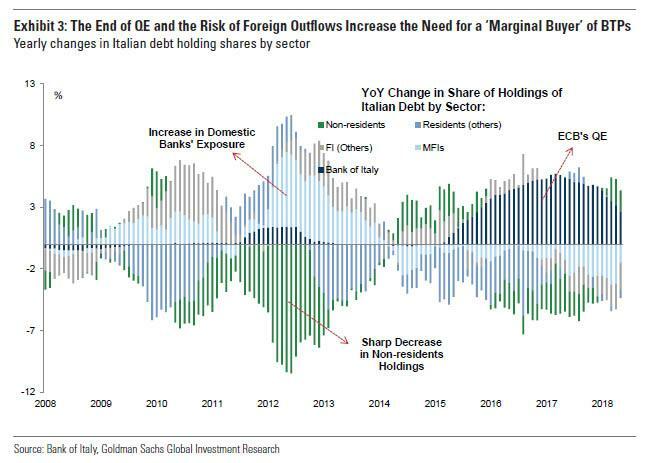 One week ago, Goldman published a report in which it warned that the Italian bond market faces a "huge structural shift" unless a "marginal buyer" of last resort emerges to replace the ECB as the backstop of Italian government bonds. Well, overnight one did emerge: a very unexpected and, as it turns out, "comical" one. According to a report in Italy's Corriere della Sera, President Trump told Italian Prime Minister Giuseppe Conte that the U.S. is willing to help the country by buying government bonds next year as Italy seeks to refinance its debt. Conte then told Italian officials about the offer after returning from his meeting with Trump at the White House three weeks-ago, Bloomberg reported. Which probably assumes that Trump won't be busy trying to help the US find buyers for its own debt first, which considering the trillions in new issuance coming down the pipeline to fund Trump's fiscal stimulus and which have to be digested without sending yields higher, may be a generous assumption. Then came the humor: "I laughed quite a lot, when I saw the report,” Jan von Gerich, chief strategist at Nordea Bank told Bloomberg. "I am not aware of any portfolios that he has direct control over." Trump could probably use his clout to try to persuade domestic investors or public pension funds to buy "but that would most likely amount to something nominal rather than significant amounts." Trump's enthusiasm is understandable: the US president has frequently "expressed his support for anti-immigration movements in Europe and political leaders who challenge the established European Union order." 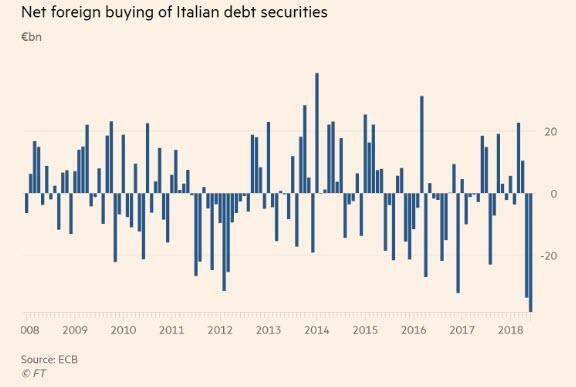 ... as a result of a record liquidation of Italian bonds by foreign investors in two consecutive months as reported overnight. According to Bloomberg, "lo spread" (i.e., the 10-year yield spread over Germany) could blow out to 470 bps, the highest level since the euro area debt crisis, from 275bps, should the budget break the EU’s deficit limit of 3%. The spread was little changed Friday. Trump market intervention comedy aside, what was more disturbing is that Salvini took a page right out of Erdogan's playbook when he told Corriere that he "sees signs of an economic attack against the country." As a reminder, that line of reasoning did not end up well for Ankara or Turkish capital markets.